Certified Project Manager International Master Project Manager Training Project Management Certification Institute Project Management AssociationDesignation Qualification Designation Institute Association Project Managers Project management certification Institute and Project Management Training AAPM Certified Project Manager Certification along with courses edcuation online courses seminars degree links and project manager training institute of the American Academy of Project Management Master Project Man ..
3 links pointing to Certifiedprojectmanager.org were found. Individual words like Project, Manager, Management and Certified are frequently used in text links from other websites. The most important links to the website are from Icecc.com and Abundancebible.com. The homepage of Certifiedprojectmanager.org and the subsite /mentz.html are most referenced by other websites. The table shows the most important links to Certifiedprojectmanager.org. The table is sorted in descending order by importance. The table shows websites of Certifiedprojectmanager.org, which are often linked by other websites and therefore they are classified as important content. two profiles were found for Certifiedprojectmanager.org in social networks. Among other social networks the website is represented in GooglePlus and LinkedIn. The web server used by Certifiedprojectmanager.org is run by GoDaddy.com, LLC and is located in Philadelphia, USA. There are many websites run by this web server. The operator uses this server for many hosting clients. In total there are at least 147 websites on this server. The language of these websites is mostly english. The Certifiedprojectmanager.org websites were developed using the programming language ASP.NET and served by a Microsoft-IIS server. HTML 4.01 Transitional is used as markup language on the webpages. To analyze the visitors, the websites uses the analysis software Google Analytics. The website does not specify details about the inclusion of its content in search engines. For this reason the content will be included by search engines. 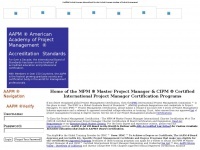 The visitors are redirected to the homepage of the website "/certifiedprojectmanager.org/".